Brake Pads -. Cast iron, plate occurs by a spring supported them lower ends on eccentric fingers and upper - on the expansion fist. Pads are supplied with 2 friction linings. 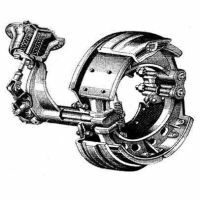 In order to prevent lateral displacement of pad hold plate clad fingers at the other end of the bracket, covering garter spring. Expansible produce fist shaft. At the outer end (with slots) worth lever inside the cat-th stands with a worm gear. Rod lever is connected to a diaphragm sandwiched between the lid and the brake chamber housing. The compressor needs to maintain a constant supply of compressed air. For this and give piston compressor with 2 cylinders on the cylinder head, and is driven via a belt pulley of the cooling fan. It includes a housing, a rocker arm 2 inlet and 2 injection valve, connecting rods, crankshaft, cylinder head, a plunger 2, pistons, drive pulley 2 and the rod. Due to the vacuum, which is created by the compressor, the piston goes down and the delivery valve moves to the closed position. Following the inlet valve opens and the compressor via the pipe in the cylinder falls purified air filter. When the piston moves upwardly, closing the intake valve occurs, air is compressed in the cylinder and its pressure opens the delivery valve, through which a head camera is located air. The head is cooled by the water method. Brake valve is formed with rubber flaps and elastic conical diaphragm of rubberized fabric. The diaphragm is clamped between the lid and the body of the crane, and it is connected with the guiding glass. On the axis of the housing should brake valve lever. In case there is a valve which closes the discharge hole and the spring together with the glass. The exhaust and intake valves are provided with return springs. When the wheels are in the braked state, a conical exhaust valve is open and the internal cavity is connected to the brake chambers of the brake valve cavity. And in turn sogpryagaetsya cavity with the atmosphere, and a conical inlet valve is closed due to the spring pressure. Brake pedal is lowered and joined to it displaces the thrust lever of the brake valve. He in turn clamps the saddle, balanced by a spring to the outlet valve. The rod connecting valves, opens the inlet. As a result, brake chambers are filled with compressed air and the wheels are braked.